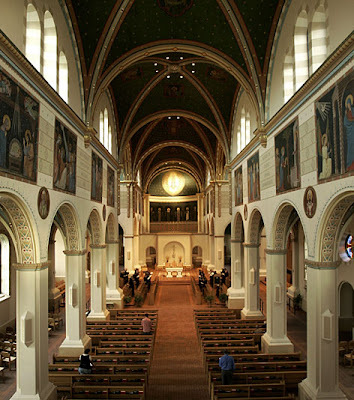 Conception Abbey in Conception, Mo. What is it like when a monk dies in the monastery? Father Malachy was 94 years old and had lived in our infirmary for about ten years. About a month before he died we could see that his health was deteriorating. He fell a few times when trying to get up from his chair or trying to walk and began to want smaller amounts to eat. Finally he was bedfast and had to be taken care of while in bed. Monks of the community were in and out of his room many times throughout the day. Many of them would pray with him and many times Father Malachy wanted a blessing if it was a priest or he would give others his blessing. Finally the last day or so he was in a coma and could not respond to those who came and went. Father Malachy in his later years always liked to have a Root Beer float. Only about a day before he died he asked for one of these and when we brought it to him he drank the whole thing. When he died there were at least 2-3 monks with him and the prayers for the dying had been prayed. Other monks were in the infirmary. It was a peaceful and happy death with the community present. 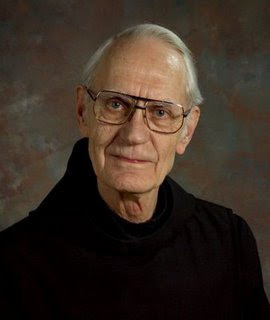 On November 4th Father Regis Probstfield went to his eternal reward. He too had taken up residence in the infirmary even though he was only 77 years old. His heart was failing and he was becoming weaker and weaker. On the afternoon of November 4th he had a doctor appointment in St. Joseph. The doctor thought he should probably be admitted to the hospital but Father Regis wanted to return home. He came home very tired and sat in his recliner to relax and rest. He asked the nurse that evening to bring supper to him in his room. She brought it and then left for a while. When she returned he was lying across the bed and having a great deal of difficulty trying to get his breath. She immediately called me as director of the infirmary. I went over and saw that he was dying and immediately called the Abbot out of the refectory. He was dead by the time the Abbot arrived but we prayed the prayers for the dying. He too was ready for death, as he mentioned a number of times and had a peaceful death. None of the community was with him when he actually died but we were soon there to pray for him. Certainly we mourn and miss our confreres who pass on to eternity. We have known them for many years and have been their friends and brothers. But, with our faith we try to express our belief that the confrere has gone on to where we are all hoping to go – the kingdom of heaven.